Two bands are sterling silver bands and a 9 carat rose gold. The ring fits the elegant man as well as the sophisticated modern woman. 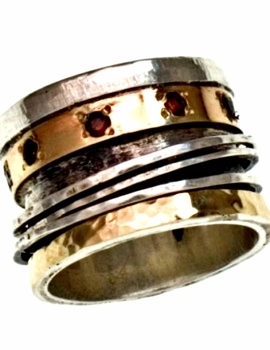 Sterling Silver 925 and solid gold in 9 carat are used to create this designer handmade vintage look spinner rings. This amazing ring is created by several smaller bands that spin on a sterling silver base ring. The ring design is inspired by the beauty of vintage style jewelry. susan laughter on Aug 11, 2016 5 out of 5 stars Shipped quickly, gorgeous ring. I love it.